High precision pressure reducing valves for air, with built-in separator & trap. Is Your Steam Quality Worse Than You Think? 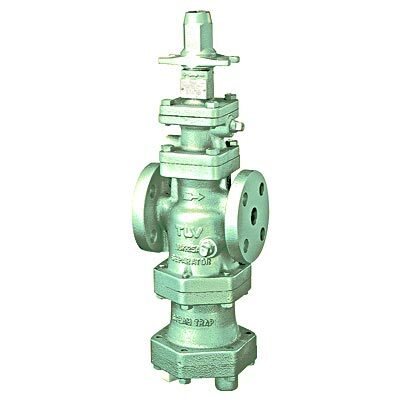 Accuracy of pressure reducing valve's secondary set pressure is within ± 0.01 MPa. Even if the air flow (load) to the equipment or the pressure reducing valve primary pressure fluctuates, the Shock Absorbing Spherical Piston (SAS) supplies air at a constant pressure. Stable operation is possible through the supply of air at a stable pressure to the air-using equipment. Condensate entrained inside the air piping is removed, enabling the supply of very dry air. Product features a built-in Cyclone Separator with a 98% condensate separation efficiency. The separator improves the dryness of the air and removes scale entrained in the air. The condensate that is separated out is quickly removed through the built-in Free Float® trap. This allows for the prevention of the problems that would be caused if condensate were to enter the air-using facilities. Pressure adjustment is simple, and can be done by using the cover cap as the adjustment spanner. Rust presents a high risk to vital areas of the system. To eliminate this, all major valve components are made of stainless steel to prevent rust and corrosion. Additionally, the inclusion of a strainer in the piping installation prevents the inflow of rust and other debris, protecting the valve components and contributing to a long service life.